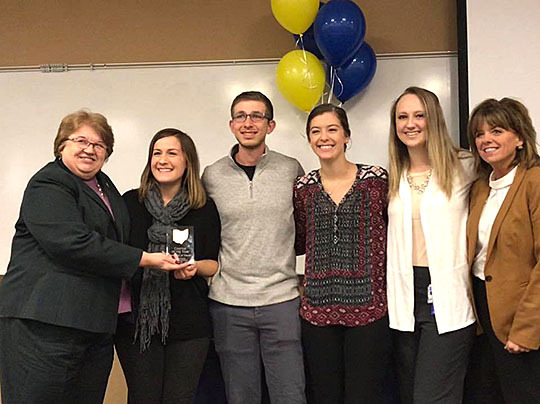 The award comes from the Ohio Student Nurses Association, which recognized the group’s outstanding work in leadership development and community service. UT is also one of just a handful of schools nationwide to receive the Stellar School Award from the National Student Nurses Association, recognizing its continued involvement in the organization. Dr. Linda Lewandowski, dean of the College of Nursing, left, and Patricia Sopko, an instructor in the UT College of Nursing and the adviser of the Student Nurses Association, right, showed off the UT chapter’s award with students, from left, Jensyn Huffman, Hunter Perrin, Rylee Rosentreetor and Allison Patton. The Student Nurses Association, which has chapters at colleges and universities across the country, is dedicated to fostering professional development and promoting the standards, ethics and skills that students will need as they enter the profession as licensed nurses. Sopko said one of the projects that helped UT earn chapter of the year was its volunteer mentorship program that pairs students in their first semester of nursing school with students who are deeper into the curriculum. The UT chapter is also heavily involved in community service projects. The group has held stuffed animal drives for Lucas County Children Services, provided health education and after school programming at Sherman Elementary, worked with Mom’s House Toledo to adopt local families for the holidays, and recently led a drive to register bone marrow donors. That effort added nearly 100 names to the national registry. This entry was posted on Thursday, January 10th, 2019 at 3:09 am and is filed under News, Nursing, UToday .